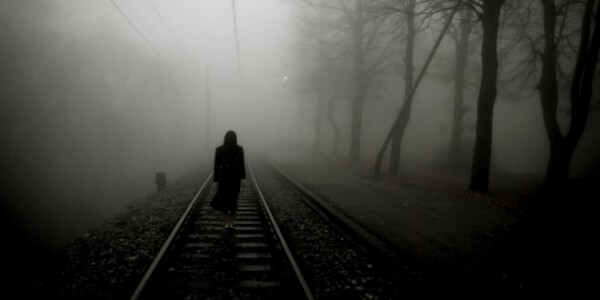 Today I offer you a spooky short story, perfect for one-sitting reading or listening: "The Four-Fifteen Express" (1867) by Amelia B. Edwards. - You can find a free audio version of the story for download from Librivox here. - You can read the complete story online here. It was a large station, and Mr. Dwerrihouse had by this time got more than half-way to the farther end. I, however, saw him distinctly, moving slowly with the stream. Then, as I drew nearer, I saw that he had met some friend, that they were talking as they walked, that they presently fell back somewhat from the crowd and stood aside in earnest conversation. I made straight for the spot where they were waiting. There was a vivid gas-jet just above their heads, and the light fell upon their faces. I saw both distinctly--the face of Mr. Dwerrihouse and the face of his companion. Running, breathless, eager as I was, getting in the way of porters and passengers, and fearful every instant lest I should see the train going on without me, I yet observed that the newcomer was considerably younger and shorter than the director, that he was sandy-haired, moustachioed, small-featured, and dressed in a close-cut suit of Scotch tweed. I was now within a few yards of them. I ran against a stout gentleman, I was nearly knocked down by a luggage-truck, I stumbled over a carpet-bag; I gained the spot just as the driver's whistle warned me to return. To my utter stupefaction, they were no longer there. I had seen them but two seconds before--and they were gone! I stood still; I looked to right and left; I saw no sign of them in any direction. It was as if the platform had gaped and swallowed them. "There were two gentlemen standing here a moment ago," I said to a porter at my elbow; "which way can they have gone?" "I saw no gentlemen, sir," replied the man. The whistle shrilled out again. The guard, far up the platform, held up his arm, and shouted to me to "come on!" "If you're going on by this train, sir," said the porter, "you must run for it." I did run for it, just gained the carriage as the train began to move, was shoved in by the guard, and left, breathless and bewildered, with Mr. Dwerrihouse's cigar-case still in my hand. It was the strangest disappearance in the world; it was like a transformation trick in a pantomime. They were there one moment--palpably there, talking, with the gaslight full upon their faces--and the next moment they were gone. There was no door near, no window, no staircase; it was a mere slip of barren platform, tapestried with big advertisements. Could anything be more mysterious? I'll read this later--the excerpt was fascinating! Yay, I'm so glad you liked the excerpt. Happy reading! Oh, thanks so much on both counts! I'm always grateful to see Librivox bring out new recordings. Their readers have great taste!